With the conclusion of the growing season I am starting to focus more energy on renovating the website, adding new podcasts, and writing more— with that I am introducing a new aspect to the blogroll, that is CIDER REVIEWS! I’m certainly far from a cider expert, but I am extremely geeked on this lovely fermented beverage we call cider. Before going much further I’ll make the necessary distinction between what I’m referring to as ‘cider’ and the raw, unfermented fresh apple juice that most Americans call cider. In England, France, Spain, and practically every other neck of the world the term ‘cider’ refers directly to fermented apple juice, not fresh apple juice that has been misleadingly called cider with the craze of the autumnal trend of cider and donuts. I digress. There’s an artful craft and beautiful tradition to cider making that is ages old and is making a timely resurgence in North America and particularly here in Michigan. Not to mention it’s the second fastest growing beverage industry next to craft beer! The apple after all has become a universal fruit whose fermented juice is not only an excellent, nutrient dense, preservable food source and inebriating drink, but also a very delectable beverage that can range from sweet and bubbly to dry and tannic, and everything in between. As I write this I can hear the rhythmic ‘plump…plump’ of the airlocks releasing gas on the some 70 gallons of cider fermenting in my basement! More on that later…can you tell I’m a bit excidered? The cider I’ll be reviewing today comes from the outspoken permaculture expert and tree crop guru— Mark Shepard. New Forest Farm is his 106 acre perennial ag sanctuary in southwest Wisconsin; there he raises chestnuts, hazelnuts, hazelnut finished pork(! ), apples, and a variety of other crops. They’ve been producing cider for a few years in an expanding on-farm facility and the cider is currently available only in southern WI (I got mine from a friend who took his PDC earlier this year). His ciders go by the name Shepard’s Hard Cyder. 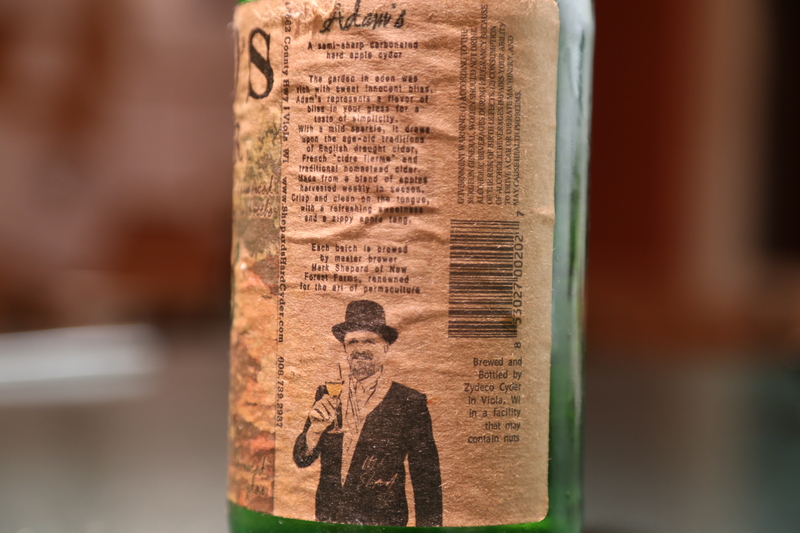 Note the spelling here… cyder with a Y is another variation simply referring to the real-deal stuff made with love and craftsmanship, not the watered down, from-concentrate, preservative ridden, commonly available neo-American hard ciders! Whew. 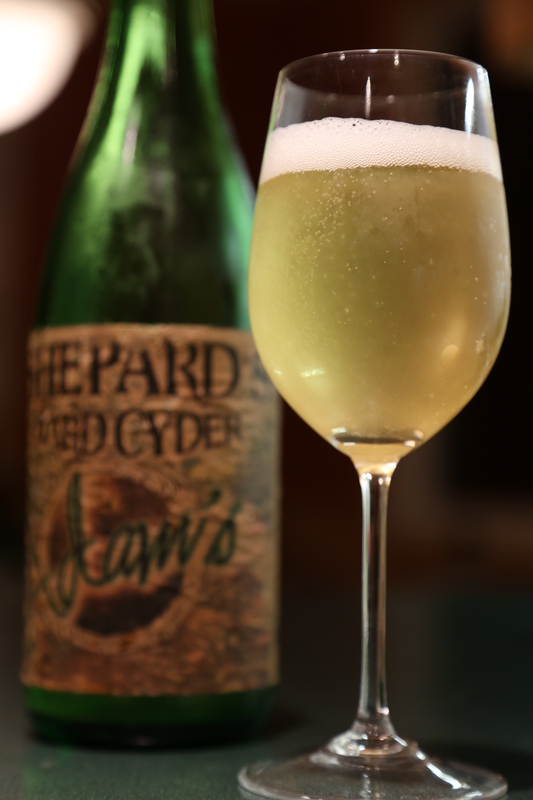 Out of the three cider offerings from Shepard’s Hard Cider we’ll be looking at one called Adam’s (which you could guess accompanies it’s counterpart—Eve’s). Upon opening it was very gaseous and perhaps too carbonated from being over primed, furthermore we had to open the bottle over the sink and it took a few minutes to settle down. Once poured the cider had a light golden color and moderate clarity, with a foamy head that slowly receded to about a quarter of it’s initial size. In both appearance and aroma it resembled a champagne with a very subtle apple pie fruitiness on the nose. Upon first sip the boldest character was its crispness and effervescence. It was relatively dry and lacked the sometimes overbearing cloyingly sweet flavor so common in the lesser grade commercial ciders. I also appreciate the moderate acidity that gave this cider its refreshing tang. However aside from it’s dryness and mild sharpness, it lacked overall body and depth of character…almost bordering bland after the immediate burst of flavor. I am unsure but perhaps this is because Shepard is using run of the mill dessert apples rather than some of the bitter and bittersharp cider varieties that offer richer body and complexity. For a mid-range gravity sparkling cider weighing in around 5.5% ABV it was GOOD…one I’d really enjoy on a hot summer day. I look forward to eventually tasting more from the Shepard’s Hard Cyder line.